Key details about privatization projects will remain secret under the Liberal government’s proposed Access to Information changes. CUPE researcher Robert Ramsay presented our union’s concerns to the House of Commons committee studying Bill C-58. 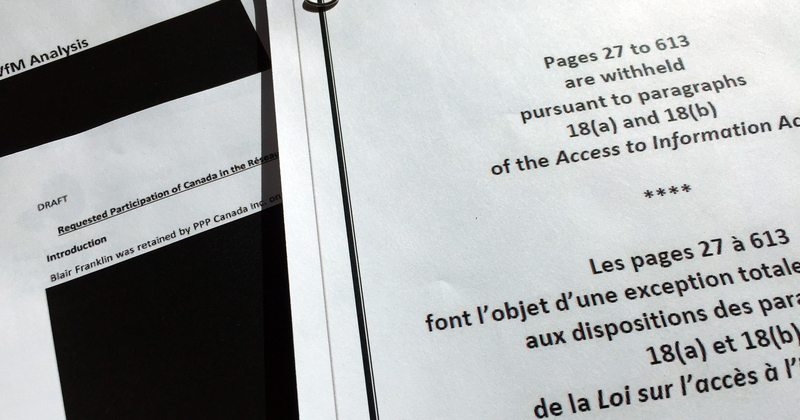 Bill C-58 is legislation amending the existing Access to Information Act. CUPE and other critics are warning that instead of broadening access, Bill C-58 creates new barriers for people who want to access information about the federal government and its departments and operations. CUPE is calling for the Liberals to uphold and expand the public’s right to know essential information about privatization. This information is routinely not fully disclosed under the existing laws. Ramsay emphasized that existing limits on access to information keep Canadians in the dark about the true costs of privatization deals – public-private partnerships, contracting out, Social Impact Bonds or other schemes. These projects are often promoted with unfounded claims they are cheaper than publicly financed, owned and operated projects. CUPE has long fought for access to the full details of privatization deals, particularly P3s. P3s are justified using a biased and secretive evaluation process. But the private sector’s claims of “value for money” can’t be proven, as key details are blacked out of any documents that are made public. The Liberal election platform and ministerial mandate letters committed the government to more openness and transparency. But C-58 breaks that promise, including when it comes to disclosure around privatization. None of the government’s proposed reforms will open the books on privatization so the public can know its true costs. When CUPE and other independent evaluators do gain access, the facts show privatization costs more. An Ontario auditor general study of 74 P3 projects found they cost $8 billion more than if they had been publicly financed, owned and operated. The study also found there was “no empirical evidence” to justify the projects going ahead as P3s. Lifting the veil of secrecy surrounding the Canada Infrastructure Bank and its projects is another key priority for CUPE. The bank will be covered by the same rules that limit transparency, and comes with even more restrictions on disclosure. CUPE helped fund a Columbia Institute report on the Canada Infrastructure Bank’s lack of transparency. Access to information requests submitted to governments about P3s and other privatization projects are “often denied, delayed or redacted. This erodes the transparency and accountability needed for the functioning of a healthy democracy,” warns the Institute. CUPE is calling for the government to scrap Bill C-58 and fully consult with the public and key stakeholders about how to modernize the Access to Information Act. It’s time for the Liberals to uphold and expand the public’s right to know essential information about federal agencies, departments and elected officials.